The WD500Z5-1 Wall Mounted Dimmer allows remote ON/OFF control and dimming of connected lights. 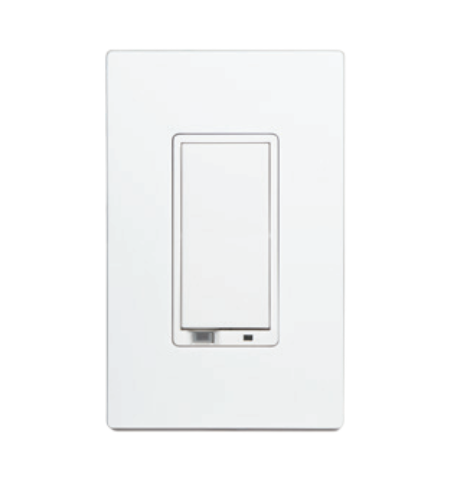 The Z-Wave Wall Mount Dimmer is easily wired in place of a standard wall dimmer. This device requires a Neutral connection. The Wall Mounted Dimmer integrates with other Nortek Security & Control Z-Wave enabled products, and can also act as a wireless repeater to ensure that commands intended for another device in the network are received (useful when a device would otherwise be out of radio range). The WD500Z5-1 Wall Mount Switch has a field replaceable trim ring – the color of the device can be altered with the Trim Ring Kit model in black, brown, almond and ivory. Unique to Nortek Security & Control, the Auto-Sense feature allows for local lamp activation independent of the Z-Wave controller status.